Thirteen patients from Akron Children’s Hospital Mahoning Valley attended the U.S. Air Force Thunderbirds exclusive Meet and Greet event in May. All patients received a program, poster and pin from the Thunderbirds, an elite group of pilots who perform aerial demonstrations. 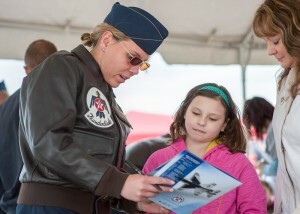 Major Caroline Jensen helped Breanna Realty figure out which Thunderbirds’ autographs she needed to complete her collection. “This is fun, but it’s cold!” shouted Breanna as she jumped up and down. Major Joshua Bordeaux asked Owen Culp if he thought the planes were too loud. “A little, but I wasn’t scared!” he said. His mother reminded him of how often he jumped when the planes roared overhead. “It makes me jump every time, too,” said Maj. Bordeaux. “Was it as loud in the plane as it is on the ground?” asked Mason Burrows, 9, who hopes to become a pilot. Jacob Syphert, 10, attended the show for the first time with his dad. He didn’t really have a favorite part. “I just liked all of it,” he said. “We weren’t sure what to expect, but he had a great time,” his mom, Zoe Burggraf, said. Major Brent Davis of the 910th Airwing credits the Thunderbirds public relations team with creating this event. “They value our youth – especially those with chronic or life-threatening illnesses- those that would have a difficult time coming to see the show,” Maj. Davis said. 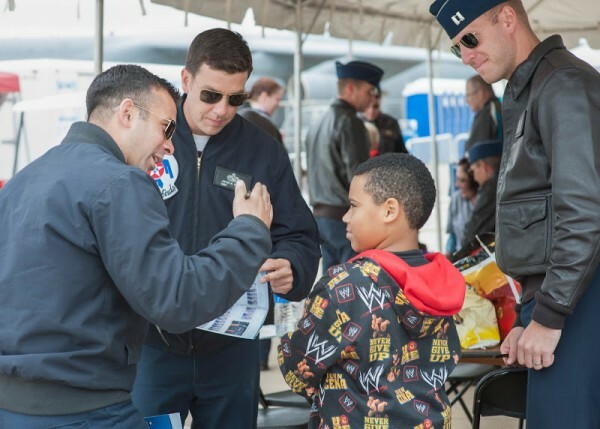 The patients of Akron Children’s are lucky as only one other local group – Trumbull Career and Technical Center – received a visit from the Thunderbirds.